Posted by FTR ⋅ February 20, 2008Post a comment Email This Post Print This Post Tweet This! In 1963, New Orleans was a hotbed of CIA-sponsored anti-Castro guerrilla activity. Sometimes called the “Casablanca of the South,” the Big Easy was awash with intrigue and mystery. Into this conspiracy-laden atmosphere stepped one of America’s most inexplicable historical figures: Lee Harvey Oswald. 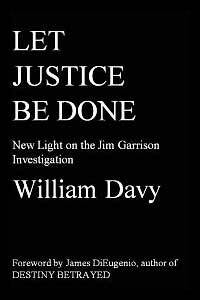 Three years later Jim Garrison, the District Attorney of New Orleans, would launch his own probe into the New Orleans aspects of the Kennedy assassination. A popular and flamboyant figure, Garrison added to that reputation by charging New Orleans businessman, Clay Shaw, with conspiracy to murder President Kennedy. After two years of controversy, Shaw was finally tried and acquitted, but not before the Garrison investigation would sharply divide the city of New Orleans and the critical community. In 1991 the debate was once again met as Oliver Stone’s popular film JFK electrified audiences and re-ignited the Garrison controversy. Now, in 1999, a new work has explored this issue in acute detail. In Let Justice Be Done, the author has conducted an unparalleled investigation into one of the critical episodes of the 1960’s. Let Justice Be Done is an important historical “post-mortem” in which the author utilizes diligent interviewing, research, and newly declassified documents to recount an important page in our country’s history. Available online, or from the publisher. Learn more about Bill Davy.